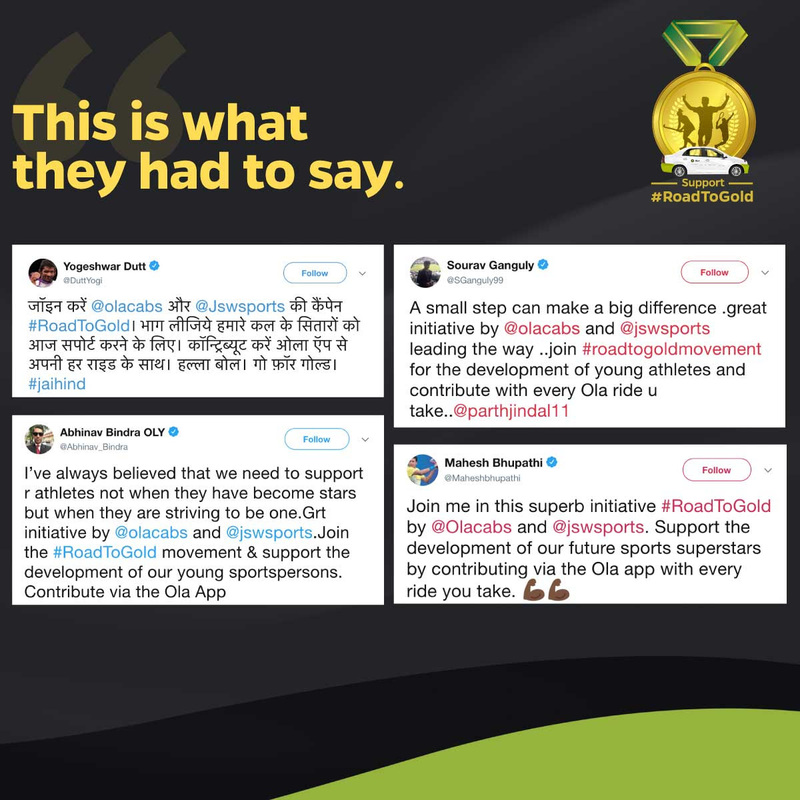 We have started our journey on the #RoadToGold with support from some of the nation’s top celebrities leading from the front – Akshay Kumar, Sourav Ganguly, Mahesh Bhupathi, Abhinav Bindra, Yogeshwar Dutt & many more! You too can join the movement too by contributing Re.1 with every Ola ride you take. 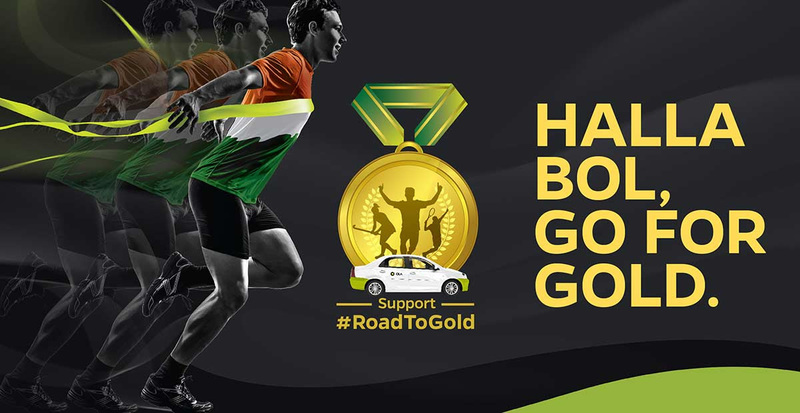 Together, we hope to support the next generation of Indian athletes on their #RoadToGold. The future champions of India need your support. Halla Bol, Go for Gold! Ola will be facilitating voluntary contribution on the App and the proceeds will be used to promotion of sports by JSW. The Contribution will be made in the form of payment chosen by You for the Ride, whether Wallet or Card. The Contribution will be represented in Your final invoice as “Donation”. 1. This Contribution will be added to each Ride, until such time when You deactivate the opt-in from profile section, namely “Donations” and by disabling the toggle button. Such deactivation can be reversed by You at any time, by going to the profile section and turning on the donation setting in “Donations” section. 2. Any Contributions made by You, cannot be refunded or cancelled once You have opted in for the Contribution on the App and a Ride has been allotted. 3. Ola will duly transfer the funds to IIS as per arrangements between Ola, JSW and IIS. 4. Your Contributions in one year will not be permitted exceed Rs. 2000. In the event, that the total Contribution made by You reaches this ceiling, Ola will automatically disable the function for Your Account. 5. Notwithstanding the contents of this Clause (3), in the event a Ride is cancelled, the Contribution will also stand cancelled. The Contributions can be made across all categories on the App, except on cash rides, corporate rides and any bookings made through Ola kiosks. Ola will not be liable for the issuance of 80G certificate under the Income Tax Act. You will be provided an 80G certificate for tax exemption corresponding to Your Contribution by IIS, as per laws applicable to IIS, through the link communicated by IIS. This link shall appear on Your App. You agree and consent to Ola sharing your information with JSW and IIS for the purposes of facilitating the 80G certificate. Other than this sharing of information for this particular purpose, both Ola, JSW and IIS shall remain bound by confidentiality requirements. All proceeds of the Contributions from You will go to IIS for implementing their charitable purpose promoted by JSW. Where the Contributions are deactivated by Ola due to any non-compliance with applicable laws, Ola shall refund, the total Contribution made by You to You, where such amount has not already been transferred to IIS. Ola may amend these terms and conditions, at any time without prior notice to the You. Any changes will be effective upon posting of the amendments/modifications on the Site, and such amended terms and conditions will thereupon apply to and be binding You. By continuing to access or use the Site or any features attached to it, You will be deemed to have agreed to accept and be bound by such amended terms and conditions. If You do not agree to the amended terms and conditions, You must discontinue accessing the Site, Ola Share and/or its features immediately. The date on which the last update took place, is reflected in the legend ‘Last updated on’ at the beginning of this document. This entry was posted in Uncategorized and tagged Akshay Kumar, Go for Gold, Gold Movie, Halla Bol, JSW sports, Mouni Roy, ola, Ola Blog, Sourav Ganguly on August 10, 2018 by sanjit roy.